VW acknowledged the scandal in a print ad that ran in more than 30 newspapers. Volkswagen of America bet on German engineering, rather than contrition, as the underlying message for its broadcast advertising during the height of its diesel-emissions scandal. Ad experts say it was the best option in a bad situation, but not an antidote. 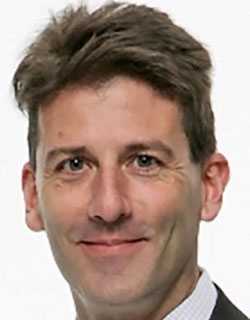 In the ads, VW consistently touted the technology, performance and safety of its vehicles, with no apology or acknowledgment of the diesel crisis, said Biju Thomas, senior director of product management and data for Media Monitors, a White Plains, New York, firm that tracks the frequency and content of broadcast ads. "They kept hammering at the same message," Thomas said. "They're trying to blunt the negative messages coming out of the scandal." Independent data show the strategy has delivered mixed results at best. It's too soon to analyze sales numbers, and perceptions of the VW brand haven't returned to pre-crisis levels. Getting there, analysts say, may require an extra helping of German engineering. In analyzing VW's advertising from November 2015 through July 2016 -- the period between the EPA's notice of violation and VW's agreement to a $15 billion settlement with regulators and customers -- Media Monitors found that VW's focus was to convey brand strength even in a time of crisis. VW raised its spending on broadcast advertising during the peak of the scandal. VW's advertising activity grew each month after the scandal broke in September 2015, peaking at about 300,000 advertising airplays in May 2016 vs. 100,000 just before the scandal erupted. VW broadcast ads consistently focused on technology, performance and safety. VW's strategy appears to protect the brand's reputation by not initially discounting prices. VW did not apologize for or acknowledge the diesel issue in its broadcast spots. VW acknowledged the scandal in a print ad soon after the EPA issued a notice of violation to the company, a VW spokeswoman told Automotive News. In November 2015, VW took out an ad in more than 30 newspapers noting that it was "working to make things right" for customers, while plugging a goodwill payment to affected owners. In the ad, VW Group of America's then-CEO Michael Horn stated that "over the past several weeks, we've apologized to you, our loyal customers, about the 2.0L VW diesel emissions issue," referring to spoken apologies from executives. "As we work tirelessly to develop a remedy, we ask for your continued patience." The ad didn't acknowledge the crux of the scandal: VW's creation of a software device designed to deceive emissions-testing equipment so that vehicles would appear to comply with U.S. standards for nitrogen oxide emissions. The purpose of the ad, VW spokeswoman Jeannine Ginivan wrote in an email to Automotive News, was to thank customers for their patience because, "At the time, we did not know how long a resolution would take." VW declined to make its vice president of marketing, Vinay Shahani, available to comment for this report. At an Automotive News marketing seminar in the fall, Shahani said his team's focus was on driving sales and launching new products. 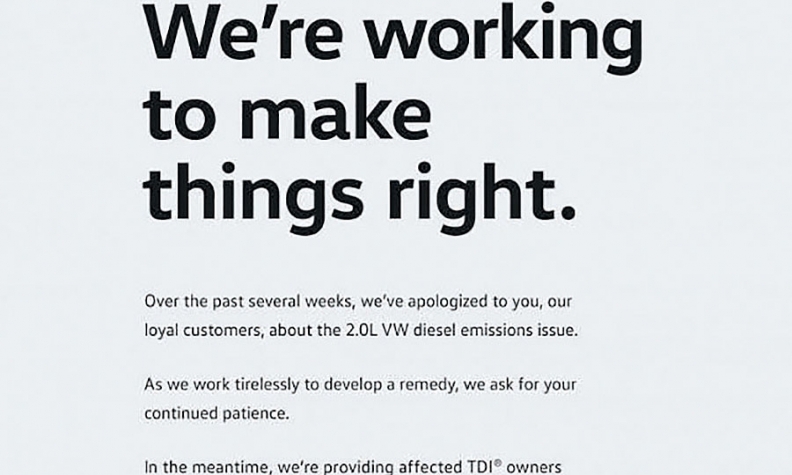 Some ad experts say VW's print apology lacked credibility because it left out any mention of the deception. Then again, "Corporate apologies are always deemed to be insufficient, "too little, too late,'" Eric Dezenhall, CEO of Dezenhall Resources, a crisis management firm, told Automotive News. He also is the author of Glass Jaw, a guide to crisis management. "Apologies are simply the price of entry to resolving the crisis. People expect them to accomplish more than they do." And VW proceeded with caution ahead of its legal settlements with regulators and prosecutors. "If you apologize or admit to anything like that, it could be equal to admitting guilt," said Lincoln Merrihew, industry analyst at market research firm comScore in Reston, Virginia. It is more effective to talk up product than to apologize, Merrihew said. Through March this year, U.S. sales of VW brand new vehicles are up 10 percent from a year earlier to 76,290, according to the Automotive News Data Center. But the sales comparisons are skewed by the fact that VW was suddenly barred from selling its diesel vehicles in the U.S. in September 2015, putting a gash in the brand's sales in late 2015 and early 2016. Before the ban, diesels accounted for about a fifth of its U.S. sales. In any case, sales tell only half the story, said Ted Marzilli, CEO of YouGov BrandIndex, a brand research firm in New York. YouGov regularly interviews a representative sample of U.S. consumers ages 18 and older on brand awareness, brand perception, advertising and purchase intentions. "As brands advertise through a crisis, we want to know what influence it's having on consumers and potential purchases," Marzilli said. Take Toyota, which in 2010 was wrestling with reports of vehicles experiencing unintended acceleration that resulted in injuries and deaths. Before that crisis hit, Toyota had what YouGov calls a Buzz score of around 28, meaning that 28 percent more people had positive feelings about the brand than negative. Within a month of the crisis, that score had swung to a minus 60, meaning that 60 percent more people had a negative view, Marzilli said. Toyota's advertising and marketing during this period were "informed by a wide range of market factors," a Toyota spokesman said. "We did make a significant effort to get customers the facts they needed and explain how Toyota was addressing the recalls," wrote Tim Morrison, vice president of Toyota Motor North America's corporate communications, in an email to Automotive News. "One constant since that time has been an intense focus on demonstrating Toyota's commitment to safety and to putting its customers first." Despite that effort and investigations that failed to find any electronic flaws in Toyota's throttle-control system that could explain the incidences of runaway vehicles, the brand still bears scars from that episode. Its current Buzz score is 18. Similarly, VW's brand perception score plummeted into negative territory quickly within the first month of the diesel-emission news, though not as sharply as Toyota's did -- probably because VW's scandal did not involve any deaths, Marzilli said. General Motors' faulty ignition switches, the subject of a 2014 recall crisis, were linked to 124 deaths, but the news "trickled out over time," resulting in a slower and less pronounced decline in consumer perception compared with Toyota and VW, Marzilli said. Despite apologies and stepped-up advertising, "none of those three brands have fully recovered to where they stood in consumer perception pre-crisis," Marzilli said. Crisis strategists say VW's brand perception won't be repaired until it offers a fix. For now, only 2015 models, with the latest generation of VW's 2.0-liter diesel engines, have an approved fix available. "VW is in a little bit of a pickle," said Jason Vines, a former auto executive and author of a book about corporate crisis communications. "They invented this device to cheat, but they can't figure out how to meet emissions standards now without cheating," Vines said. "You're a year and a half into this and haven't done squat. And they weren't forthcoming. So as long as they don't have a fix, the issue is still alive."